Central Asia has been inhabited by humans (homo-sapiens) since at least 40-50'000 years ago. The race of these early inhabitants is not known for sure, but some scholars hypothesize they may have been ancestors of the later Indo-European peoples. By 4'500 BC, the inhabitants formed cultures like the Samara, Khvalynsk, Sredny Stog, Yamna, and others, had developed small communities which practiced agriculture and herding. The domestication of horses occured around this time and would soon transform the way of life in the area. The older cultures were replaced by new ones that were based on nomadic instead of sedentary lifestyles. Their inhabitants are mostly identified by scholars as "Indo-Iranian", included the nomadic Andronovo culture north of the Aral Sea, the BMAC (Bactria-Margiana Archeological Complex) from 2'200 BC to 1'700 BC. The BMAC ended roughly the same time as the collapse of the Indus River civilization in India, which has led some scholars to conclude that the BMAC was either the predecessor of the Indo-Aryans, or it was destroyed by them. By 700 BC, Eastern Iranian tribes known collectively as the Scythians (Sakas) dominated most of Central Asia. The Scythians weren't a unified nation; they were a series of independent tribes with similar languages and customs. For example, the Massagetae occupied Transoxiana, while the Dahae were in Margiana, the Bactrians near India, the Chorasmians near the Aral sea, etc. They often raided neighboring lands such as Iran and Armenia. They attacked Assyria in 676 BC but were defeated by King Esarhaddon. Another Scythian group overran Media from 653-625 BC before they were evicted, and it's possible the Medes followed up by annexing parts of Margiana and Bactria. 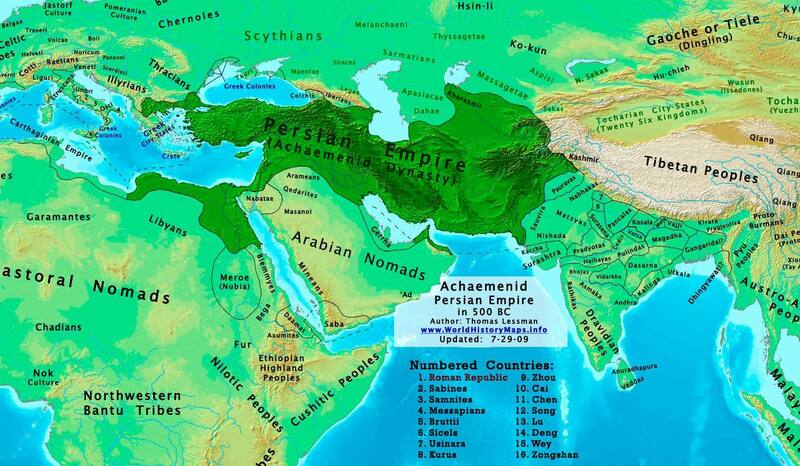 The Median Empire was overthrown by Cyrus I of Persia in 549 BC. Nearly 20 years later Cyrus invaded Central Asia and won a battle against the Massagetae before being defeated and killed by Queen Tomyris 530 BC. Cyrus' successor Darius I, apparently annexed Chorasmia, Transoxiana, and Bactria before 500 BC and organized them into satrapies. Persian control lasted (with brief interruptions) for nearly 200 years. c. 520 BC - Persian armies under Darius I conquer much of Central Asia (inc. Ferghana, Sogdiana, and Chorasmia). 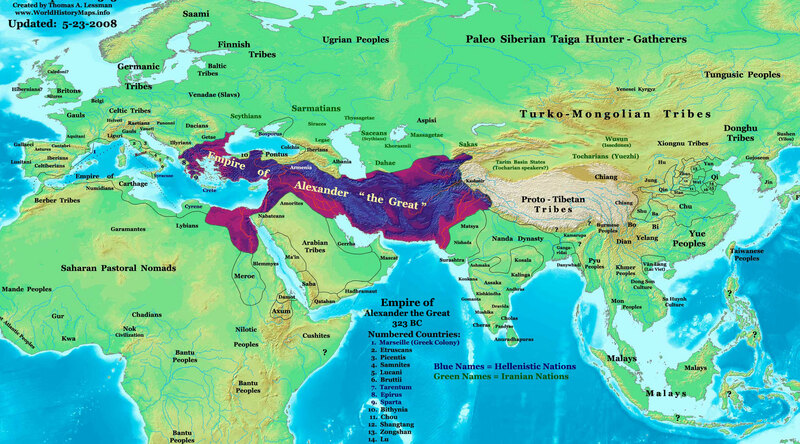 Central Asia - Alexander the Great conquers Bactria, Margiana, Sogdiana, and Ferghana in a multi-year campaign. Afghanistan - The Seleucids and Mauryans sign a treaty, which gives control over Arachosia & Gedrosia (most of modern Afghanistan & Pakistan) to the Mauryans. Central Asia - The Satraps of Bactria & Parthia break away from the Seleucid Empire and form their own kingdoms. Parthia - A Saka tribe called the Parni invade Parthia, killing Andragoras. The Parni adopt the name of their new land and crown their leader as King Arsaces I.
Bactria - King Diodotus II is overthrown by Euthydemus I, beginning the "Euthydemid dynasty". Parthia - Seleucid king Antiochus III forces King Arsaces to recognize Seleucid authority. Bactria - Seleucid king Antiochus III defeats King Euthydemus but is unable to take the capital city (Bactra). Peace is concluded when Euthydemus accepts Seleucid authority. Mongolia - Xiongnu tribes are united by Maotun to form the Xiongnu Khanate. Iran - Seleucid military power is destroyed Roman victory in the Battle of Magnesia destroy the military power of the Seleucids. India - The Mauryan dynasty is overthrown by the Sunga dynasty when a minister named Pushyamitra Sunga assassinates the last Mauryan emperor. Afghanistan - Greco-Bactrian king Demetrius I invades Sunga lands in retaliation for the overthrow of the Mauryans. Demetrius seizes Arachosia, Gedrosia, Sindh, and the Punjab region. Mongolia - The Xiongnu destroy the Tocharian (Yuezhi) federation in Kansu, and some Tochari flee westward towards Wusun and Dzungaria. Dzungaria - Northern Saka (Sai Wang) tribes are conquered by the Tochari. Some of the Sakas escape and flee south to settle in Ki-pin (near Kashmir). Iran - Mithradates I becomes King of Parthia after the death of Phraates I.
Bactria - Civil war splits Greco-Bactria when King Antimachus is overthrown by a general named Eucratides. The Euthydemids retreat to India and become known as the "Indo-Greeks". Iran - Parthian forces seize Merv & Herat from the Eucratidians during the Greco-Bactrian civil war. Afghanistan - Menander becomes king of the (Euthydemid) Indo-Greeks. Dzungaria - The Tochari are defeated by the Wusun (Issedones) and forced to flee to the southeast through Ferghana (Dayuan). Transoxiana - The Tochari defeat the Western Saka tribes (probably descents of the Massagetae). The Western Sakas flee to the south and west, invading Parthia and Greco-Bactria. Bactria - Western Sakas defeat King Eucratides II of Greco-Bactria and destroy the city of Alexandria-on-the-Oxus (modern Ai-Khanoum). Iran - Seleucid king Demetrius II invades Parthia to recover the lands recently lost to the Parthians. After some initial successes, Demetrius is defeated and captured by the Parthians. Bactria - The Tochari defeat King Heliocles I and destroy the last Greek kingdom in Bactria. The Eucratidians flee to set up a new kingdom in Kabul. Iran - Saka mercenaries rebel & destroy a Parthian army, killing King Phraates II. His uncle is crowned as Artabanus II. Central Asia - Chinese envoy Zhang Qian travels to Tochari lands in Bactria, leaving written records of the lands immediately after the Tochari conquest. Iran - Parthian king Artabanus II is killed fighting a new wave of Saka tribes. He is succeeded by Mithradates II. Central Asia - A Chinese army under Ban Chao reaches the Black Sea, marking the westernmost expansion of Han authority. Afghanistan - Parthian forces defeat the Eucratidians and seize control over Arachosia (renamed Sakastan). A Partho-Sakan clan called Suren becomes prominent in the region. Mongolia - Dingling and Wuhuan tribes rebel against the Xiongnu. Afghanistan - Indo-Parthian forces seize Gandhara from the Indo-Greeks. India - Azes I becomes King of the Saka. Mongolia - Xiongnu Empire breaks into Eastern & Western Khanates. Dzungaria - Northern Xiongu Khan Zizhou is killed by Han armies, ending the Western Xiongnu Khanate. Mongolia - The Eastern Xiongnu rebuild their empire in Mongolia. Mongolia - The East Xiongnu Khanate splits into Northern & Southern Khanates. Mongolia - Chinese sources first document the Hephthalites as a tribe called the Hoa, living in Dzungaria (north of the Great Wall). Mongolia - The Northern Xiongnu Khanate is destroyed by the Xianbei. 420 AD - Hephthalites subjugate Transoxiana and invade Persia. 427 AD - Sassanids win major victory over Hephthalites and drive them out of Persia. 454 AD - Hephthalites defeat the Sassanids and revenge their earlier loss. 470 AD - Hephthalites conquer the Kidarite Kingdom of Gandhara. Tegin (Toramana) becomes the Viceroy of this new realm, known in India as the Hunas. 475 AD - Sassanids are again defeated by the Hephthalites and forced to pay tribute. 479 AD - Hephthalites conquer Sogdiana to the north, and Kashgar and Khotan to the east. 480 AD - Hunas under Tegin (Toramana) invade the Gupta Empire. 493 AD - Hephthalites defeat the Turgesh Khaganate and extend their power to Dzungaria. 500 AD - Hephthalite armies restore the Sassanid Emperor Kubad to the Persian throne. Meanwhile in India, the Gupta Empire has collapsed and Huna armies have overrun much of Northern India. 508 AD - Hephthalites conquer Turfan and Karashar, giving them control over most of the Tarim Basin. 522 AD - Hephthalites are at the height of their power. The majority of central Asia either is under direct Hephthalite control, or pays tribute. 528 AD - The Hunas are defeated in Malwa by Yasodvarman. 532 AD - A coalition of Indian kingdoms drives the Hunas from the plains of North India. 565 AD - The Sassanids ally with the Gokturks to destroy the Hephthalite Empire. Smaller Hephthalite principalities maintain their independence in Zabul, Kapisa, Tocharistan, and other areas. The Persian Empire collapsed during the Macedonian invasion of Alexander the Great. After the Battle of Gaugemela in 331 BC, the eastern Satraps became virtually independent and it took several campaigns before Alexander finally subdued them in the 320s BC. Though his Empire fragmented after his death, his victories ushered a new era, known as the Hellenistic period after the Greek (Hellenic) culture it was based on. Alexander died in 323 BC before he could secure the empire for his son. His generals began to fight for power (called the "Wars of the Diodachi") and the empire quickly fragmented. Most of the eastern lands (including Central Asia) were seized by a general named Seleucis. Officially his realm was known as the "Kingdom of Asia", though historically it is called the "Seleucid dynasty" after its founder. Seleucis needed most of his troops in his western lands to help him fight rivals in Egypt and Macedonia. While he was thus occupied in the west, a powerful empire grew in India under the leadership of Chandragupta Maurya. The greek satraps in India, nominally under Seleucid authority, were driven out. Seleucis led an army to retake those lands but was unable to defeat the powerful Mauryan army. To ensure peace on his eastern frontier, Seleucis made peace with the Mauryans in 305 BC, surrendering control of Arachosia and Gedrosia (much of modern Afghanistan and Pakistan) to the Mauryans. In return Seleucis received over 500 War Elephants, which strengthened his army enough to help him win a crucial victory over his Greek rivals in 301 BC (Battle of Ipsus). The areas given to the Mauryans still had many Greek colonists, whose culture was respected by the Mauryans. With Seleucid attention usually focused in the west, their authority became difficult to maintain in Central Asia. Around 248 BC the satraps of Parthia of Bactria (Andragoras and Diodotus) rebelled against the Seleucids and became independent. In 244 BC Andragoras was overthrown by the Parni (a tribe descended from the Dahae), who founded the Arsacid dynasty. In Bactria, King Diodotus I died in 235 BC and was succeeded by his son Diodotus II, who allied with the Parthians against the Seleucids. The Diodotian dynasty proved short-lived however, and Diodotus II was overthrown in 223 BC by a man who became King Euthydemus I.
Seleucid authority was partially restored during the eastern campaign of Antiochus III. First Parthia was defeated in 209 BC, and Greco-Bactria recognized his authority in 206 BC (after a 3 year seige). A brief campaign to India renewed peace with the Mauryans, and the Seleucids were stronger than ever. Yet only a few years later Seleucid military power was effectively destroyed by the Roman army in the Battle of Magnesia in 190 BC. Antiochus' work quickly unravelled and within a generation Parthia and Bactria were fully independent. The Greco-Bactrians became heavily involved in India after 184 BC, when their Mauryan allies were overthrown by the Sunga dynasty. King Demetrius I attacked the Sungas between 180-170 BC and occupied Arachosia, Gandhara, Sindh, and the Punjab. While Demetrius was occupied in India, his brothers were defeated by a Seleucid general named Eucratides, who drove the Euthydemids out of Bactria. King Demetrius (II?) tried to recover Bactria but was ultimately defeated and slain. Eucratides then conquered Margiana, Arachosia, and other western lands of the Euthydemids. 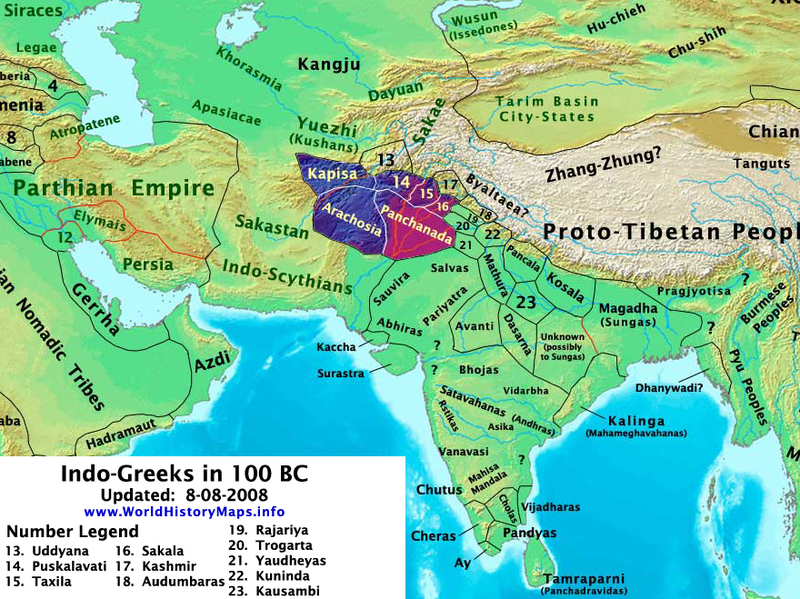 The Euthydemids maintained themselves in India under Kings Apollodotus and Menander I, and their descendents became known as the Indo-Greeks. Meanwhile, the Parthians took advantage of the Greco-Bactrian civil war to expand and secure their eastern borders. King Mithridates I seized Merv and Herat around 167 BC, and may have even penetrated into Bactria itself. The death of Eucratides (either killed in battle or murdered) in 155 BC led to a civil war between his sons that seriously weakened Greco-Bactria and left it unprepared for times to come. As the Greco-Bactrians fought amongst themselves, events in distant lands set a "domino effect" in motion that would soon reach Bactria. Near Mongolia in 174 BC, an Indo-European people called the Tocharians by the Greeks (or Yuezhi by the Chinese), were defeated by the Xiongnu and fled west. The Tocharians defeated a related tribe, the Issedones (called Wusun by the Chinese), then invaded Dzungaria and evicted the Northern Sakas (called Sai Wang by the Chinese). These Northern Sakas fled south and settled in Ki'pin (near Kashmir), shortly after Eucratides seized power in Bactria. After less than a generation in Dzungaria, the Tocharians were attacked by the Issedones and again forced to flee. They moved through Ferghana (which possibly belonged to a rising power known as "Kangju" (Kang-chu in Chinese), into Sogdiana where they attacked Scythian tribes known as Sakas, (probably descendents of the Massagetae). These Sakas fled in what became a massive invasion towards Bactria and Parthia, while the Tocharians settled in Sogdiana. Transoxiana and Bactria were the first Greek provinces to fall to these Sakas. In 145 BC the Greco-Bactrian city of Alexandria-on-the-Oxus (Ai-Khanoum) was destroyed during a massive Saka attack. The last Greek stronghold in Bactria, the Eucratidian kingdom of Heliocles I, was destroyed in 130 BC. About the same time, the Tocharians evicted the Sakas from Bactria and forced them south into Parthian lands. King Phraates II of Parthia was killed in battle against the Sakas, as was his uncle and successor, King Artabanus I. The Sakas settled for a while in the province of Aria, which became known as Sakastan. In the early 1st century BC, the Parthian Empire expanded eastward, defeating the Tocharians and subjugating the Sakas. Sakastan became a Parthian province ruled by the Suren family. By 20 AD, one of the Suren by the name of Gondophares became independent from the Parthians and founded the Pahlava or Indo-Parthian Empire. The Pahlava Empire barely outlasted Gondophares' death in 45 AD, as the Tocharians were then united into the expanding Kushan Empire. From 145 BC to 100 AD, By 130 BC the Sakas had destroyed the last of the Greco-Bactrian kingdoms, but were then defeated by the Tocharians and forced to migrate to Arachosia, which became known as Sakastan. The Parthians from Iran defeated the Sakas after 100 BC and drove them further south into Sindh. The Parthians also defeated the Tocharians and subjugated Bactria, then invaded India and conquered many of the Indo-Greek kingdoms. These Sakas were soon driven south into Sindh by the Parthians, who later broke away from Parthia proper to form the Pahlava or "Indo-Parthian" Empire. 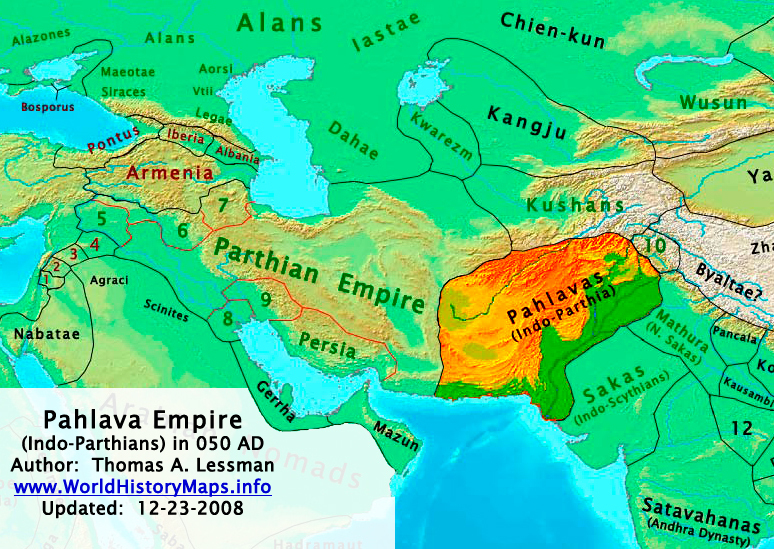 In the first half of the 1st century, the Pahlava's conquered most of today's Pakistan and much of Afghanistan, but were then defeated by the Kushans. 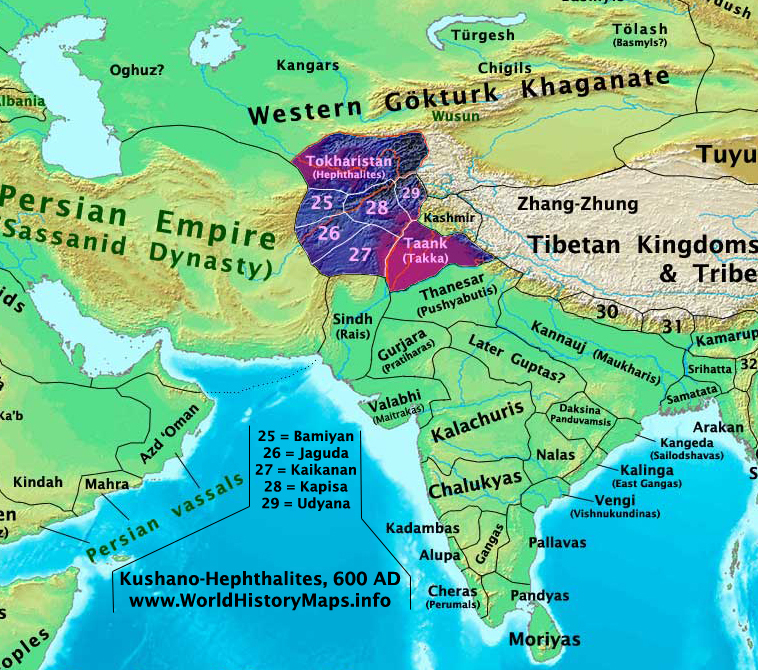 By 100 AD the Kushan Empire had succeeded in conquering much of south-central Asia and north India. 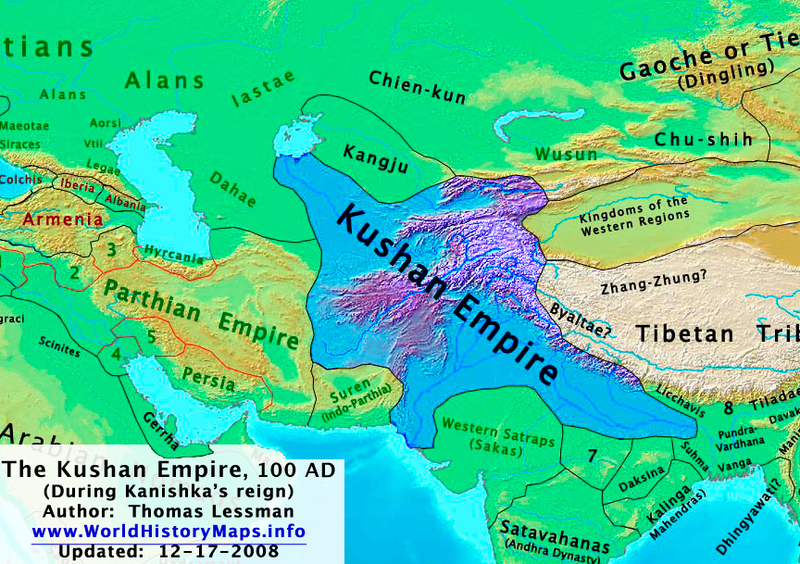 Shortly after 200 AD the Kushan Empire broke up into seperate kingdoms, an "East Kushan" kingdom in the Punjab, and the "West Kushans" in Afghanistan. The western kingdom was defeated by the Persian Sassanids by 240 and became vassals known as the Kushanshas. In the early 300's, a people known as the Xionites conquered most of Central Asia. A Xionite King named Grumbat fought the Persian Emperor Shapur in 325, then assisted the Persians in an attack on the Roman Empire. Another Xionite King conquered the remaining Kushan kingdoms and founded the short-lived Kidarite dynasty. 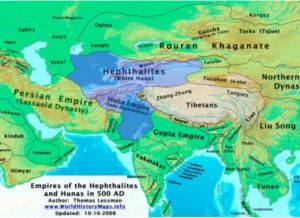 The Hephthalites (sometimes called "White Huns", also known as Hoa or Hoa-tun by the Chinese, Ephthalites by the Greeks, and Hunas by the Indians) were a confederation of nomadic peoples in Central Asia during the 5th and 6th centuries AD. Their precise origins and composition remain obscure. They were likely of Iranian or Turkish decent (or a mixture of both). According to the Encyclopaedia Britannica, they had no cities or system of writing, lived in felt tents, and practiced polyandry, while very little is known of their language. In Chinese chronicles they were originally known as Hoa or Hoa-tun and lived north of the Great Wall, in Dzungaria. 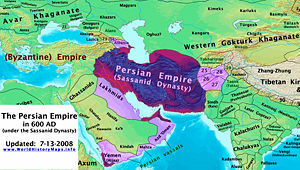 Around 420 AD they subjugated Transoxiana, then invaded Persia but were overwhelmingly defeat by the Sassanids in 427 AD. They returned in the 450s and defeated the Sassanids, reducing Persia to tributary status for a time. 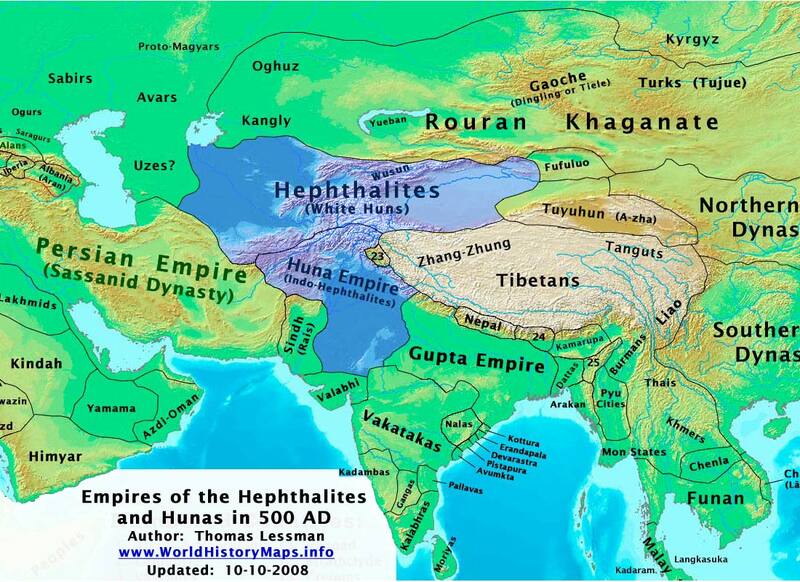 At their height in the early 500s, most of central Asia was either ruled directly by the Hephthalites or paid tribute to their rulers, while a seperate Hephthalite Empire (the Hunas) ruled much of northern India. 557 - The Hephthalite Khaganate in Central Asia is destroyed an alliance of Persians and Göktürks. 565 - A Hephthalite Khanate is re-established in Afghanistan (first at Kapisa). 562 - An Avar invasion of Thuringia is repulsed by the Franks. - The Kingdom of Silla captures Imna and drives the Japanese from Korea .